The HART protocol for communications in wireless sensor networks (WSN) is aptly referred to as ” WirelessHART”. This is based on the earlier, wired version of the HART (Highway Addressable Remote Transducer) protocol. Both the HART protocol and the WirelessHART protocol provide a bi-directional communication channel for command code and data transfer between an intelligent sensor node and the central site. WirelessHART technology provides a robust wireless protocol for the full range of process measurement, control, and asset management applications. Based on the proven and familiar HART Communication Protocol, WirelessHART enables users to quickly and easily gain the benefits of wireless technology while maintaining compatibility with existing devices, tools, and systems. 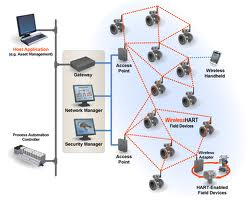 The HART Communication Foundation, its member companies and the industry leaders developed WirelessHART technology to meet the unique requirements of wireless networks operating in process plants. • Reliability even in the presence of interference, thanks to technology like mesh networking, channel hopping, and time-synchronized messaging. WirelessHART coexistence with other wireless networks is assured. • Security and privacy for network communications through encryption, verification, authentication, key management, and other open industry-standard best practices. WirelessHART allows for a wireless mesh network configuration, which is suitable for data collection in sensor networks as well factory, building and industrial automation applications. It adds wireless capabilities to the HART protocol while maintaining compatibility with existing HART devices, commands, and tools. Its three main elements are wireless field devices, gateways, and a network manager. TSMP networks also can self-organize. This means every TSMP sensor node and gateway has the intelligence to discover neighbors, measure RF signal strength, acquire synchronization and frequency hopping information, and then establish paths and links with neighbors. HART is most often used in conjunction with Oil and Gas facilities, but is expanding to other industries that require high reliability and zero tolerance for “induced events” from the communications system. The most well know companies using HART enabled devices are – Bayer, BASF, BP, Conoco-Philips, Evonik, Pemex, Shell, and Statoil. The HART protocol for communications in wireless sensor networks is just one of the many available, including ZigBee, Ethernet and proprietary implementations.